11th Ave. at Montana Ave. 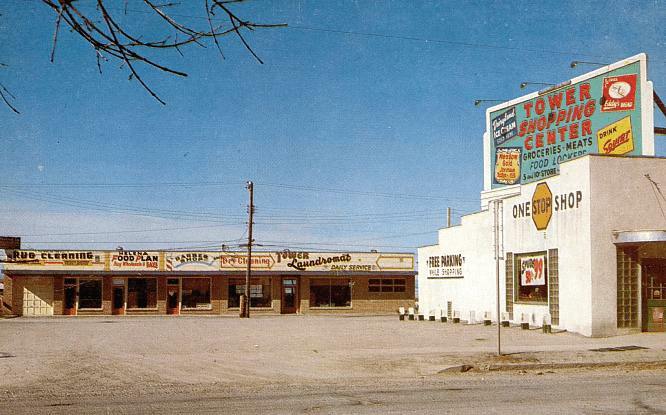 The market was so named for its close proximity to the KXLJ radio broadcasting studio and tower at 1306 11th Avenue. On Ocober 25, 1950, a grand opening was held for the expanded Tower Shopping Center, which included a variety store, and frozen food locker plant. In 1956, more shops were constructed on the north side of the lot. Helena Independent-Record story about the expanded Tower Shopping Center Grand Opening , Oct. 24 1950. This view shows the row of shops added in 1956. Judging from the angle of the sun and how empty the parking lot is, this photo was probably taken on a Sunday afternoon. Groceries, Meats, Lockers, Variety, Fishing Supplies, Laundromat, Barber Shop, Rug Cleaning, Etc. Detail of the shops which were added in 1956. Thanks to Mr. D. R. Stinson for his excellent high-resolution scan of this rare postcard.